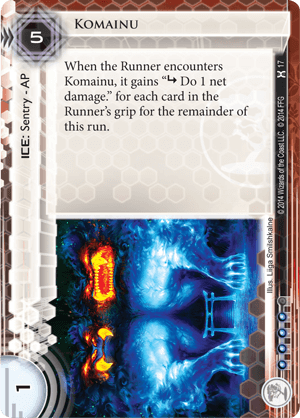 When the Runner encounters Komainu, it gains "subroutine Do 1 net damage." for each card in the Runner's grip for the remainder of this run. If bypassed - eg from being targeted by Femme Fatale - runner can now pass this ice for free as it never gains any subroutines. Although, Chum in front of this will fire if this is bypassed, even with no subroutines.